Spring has sprung and already I’m seeing many more butterflies and bees than were about even last week. They’re wonderful insects, especially loved by us gardeners for the incredible work they do pollinating our crops. So let’s show them some love – by growing more wildflowers! Flowers attract all kinds of beneficial insects – not just bees and butterflies but also predatory insects such as hoverflies and ladybirds. Together they help to boost harvests and keep common pests like aphids under control. Flowers that are rich in nectar and pollen offer the most food for these insects. Wildflowers are best because they usually have simple, single flowers that are easier for flying insects to access. And it figures that native bugs will be more familiar with native wildflowers. Your local climate and soil will determine what you can grow. Some wildflowers, for example yarrow, knapweed and ox-eye daisy cope very well with sandy, free-draining soils that are prone to drought. Others like primrose, cowslip and buttercup are better suited to heavy clay soils. Take time to research which wildflowers are native to your region then check their suitability to the conditions found in your garden to make sure your preferred wildflowers will thrive there. Plan to have flowers throughout the year if you want beneficial insects to set up a permanent home in your garden. Shrubs such as witch hazel flower from late winter, and let’s not forget the plethora of bulbs – snowdrops and crocuses, followed by daffodils, fritillaries and tulips. Native bulbs will naturally spread over time to become a permanent and very welcome feature of your garden. At the other end of the season, examples of fall flowers include sedums, ivy and colchicum (also known as autumn crocus). Our Garden Planner includes a helpful selection of flowers, including several wildflowers, that are perfect for growing within a fruit and vegetable garden. Click the ‘i’ Information button next to the plant in the selection bar for details of their cultivation and suitability as companion plants to popular crops. Drop them into your plan, and see how easy it is to incorporate flowers among your edible plants. Alternatively, select one or more vegetables in your plan and click the heart-shaped Companion Planting button to see plants that are beneficial to grow together. Many wildflowers are self-seeders, meaning they naturally drop seeds that germinate and grow on with little or no intervention from you. This is a major advantage to growing wildflowers – often you only need to plant once for a lifetime of blooms. Once you get your eye in, their seedlings are easy to spot and removing unwanted plants takes very little effort. Many self-seeders, such as Mexican fleabane, will happily establish in cracks within paving or walls. Popular self-seeders include calendula, borage, and poppies, as well as a number of biennials or short-lived perennials like teasel, hollyhock and foxglove. To introduce self-seeders in the first place simply scatter seeds onto prepared ground then rake in. If you want to grow them among your vegetables sow them in rows between crops or to the side of the plot as a ‘pollinator strip’. Alternatively, start seedlings off in pots then transplant them to where they are needed. Wildflower meadows are both beautiful and a feast for visiting bees and butterflies. By simply leaving an area of lawn alone through spring and summer – uncut, unfed and unwatered – you’ll be able to see if any wildflowers are already there. Then once you have seen what’s there you can easily supplement the display by planting plugs or bulbs of other wildflowers. Another option is to sow a wildflower mix onto empty ground. 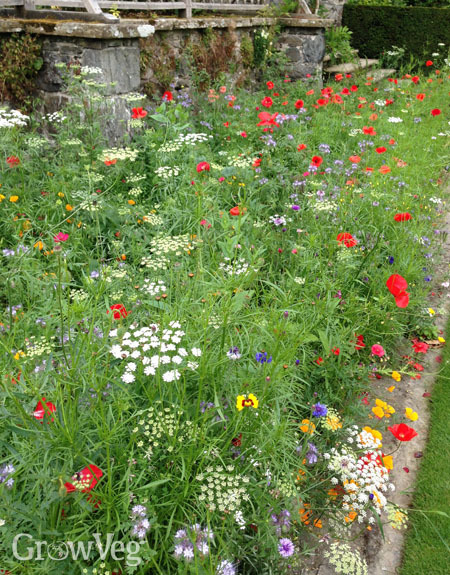 Cornfield mixes are excellent for this purpose, providing a riot of colour with an accompanying throng of insects mere months after sowing. Rake dug over, weed-free soil to a fine tilth then broadcast the seeds evenly over the surface. Rake again so the seeds are in contact with the soil then pat the surface down with the back of the rake. If it’s dry, water the sown area to speed germination along. The seedlings should appear within a couple of weeks. You can mark out areas of wildflower meadow on your garden plan by selecting the meadow texture from the palette, then choose a solid shape and add it to your plan. Wildflowers are great for bees and butterflies, and to be honest they’re pretty darn good for the soul too! Please drop us a comment below to share your favorite wildflowers for attracting these beneficial bugs. "Hi I am trying to naturalize and stabilize well maintain the river bank I live on. any ideas and suggestions greatly welcomed .only lived here almost 2 years,and I love it and want to preserve and maintain it "
"Hi Anji. Where are you looking to do this? What's recommended would depend very much on where you are, as different wildflowers are best for different locations."